Sigma's P86 - Precision Tapered Brush - Review + Discount Coupon Code | Sahrish Adeel - Malaysia based Pakistani Beauty & Lifestyle Blogger! All of us know how important it is to use the ring finger to apply concealer since it exerts least pressure but not all the times we should use a finger. It is less hygienic both for the skin and the product especially if using it on another person. I tried P86 - Precision Tapered brush by Sigma and I haven't used my finger or any other brush for concealer since then. 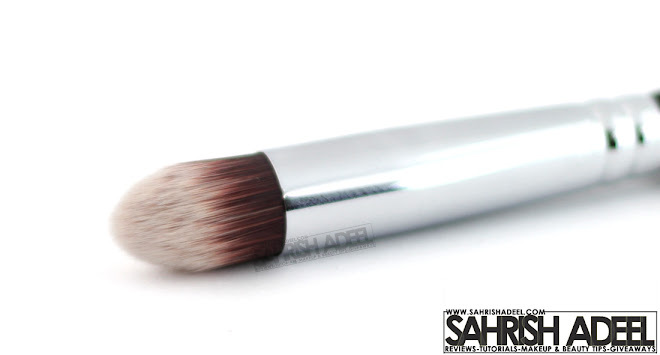 P86 - Tapered Blending brush is a synthetic brush with nicely packed bristles. It has a pointy design to reach in smaller areas. Like usual brushes, the handle has a metal part with wooden grip. It came in a card box with other brushed I ordered at Sigma, which I showed in my July 2012 haul. Synthetic bristles are easy to wash.
Picks up decent amount of product. Blends the product perfectly into the skin. Perfect to conceal areas under eyes, around nose, chin and lips. Handle gives a good grip. I did not find anything negative about this brush. I have oily skin and by using finger to conceal my dark circles, the skin gets oily during application. I started using E40 -Tapered Blending brush by Sigma a few months back and it also worked like a charm and I was pretty satisfied with except it does not reach in smaller areas, especially the area right under waterline. Still I was really happy to use a blending brush for concealer and I decided to order one more. When I was adding items in my cart on the website, I thought to add P86 - Precision Tapered brush as well. I was really excited to try it after reading so many rave reviews about the Sygmax collection by Sigma. Believe it or not, the moment I used this brush, I fell in love. It is just a perfect brush and I don't feel pressure under my eyes as well which is great. However, I still use E40 -Tapered Blending brush sometimes for an air-brushed finish, can't ditch that baby. Overall, I am in love with this brush and I haven't used any other brush when I need professional finish. If you need a professional brush for concealing which is budget friendly and have a life long durability. Go for it without second thought. I am looking forward to get New Synthetic Precision Kit by Sigma as soon as I save up enough money. Enter SB2012 at checkout to shed off some cost. This coupon code is valid throughout September 2012. You can find a new discount coupon code every month in right sidebar of this blog. P86 - Precision Tapered brush costs $14 and you can buy it here. Sigma ships worldwide. Let me know what next brush you want me to review from my Sigma Haul.